The Charsfield hotel Melbourne is arguably one of the most beautiful accommodation hotel and grand Victorian buildings in Melbourne CBD. It is a fine example of early St Kilda Road Victorian architecture and is classified by The National Trust. This luxury Melbourne hotel boasts numerous luxury hotel rooms that have been well appointed for your comfort, 2 conference rooms and lavish public areas, such as The Sitting Room, Snooker Room and Breakfast Room. The Hotel Charsfield is conveniently located close to the St Kilda Road business precinct, the heart of Melbourne's city centre and the Grand Prix circuit at Albert Park Lake. The Charsfield Hotel Melbourne is rated 4 stars but in terms of ambience and attentive attitude of staff, is definitely that of a 5 star hotel. The exemplary customer service provided by the friendly staff was recognised when the Charsfield Hotel Melbourne won the Australian Award for Excellence in Customer Service. 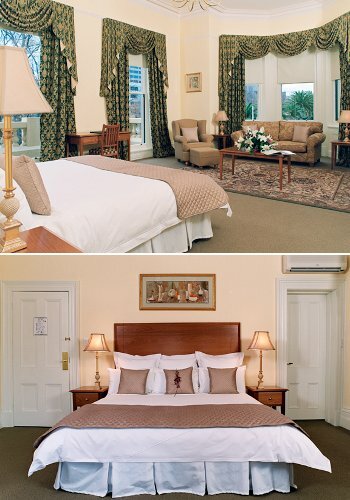 So whether you are visiting Melbourne as a business traveller, as a conference delegate, on holiday or perhaps to enjoy one of the many major events, the Hotel Charsfield is the perfect choice for accommodation in Melbourne, providing true style at a very affordable price. Double Hotel Room - This quality hotel room features a Double bed, private ensuite bathroom, air-conditioning, heating, free broadband internet access, free cable TV, DVD player, tea & coffee making facilities, hair dryer, ironing facilities and free use of the gym at the hotel. Deluxe Twin Hotel Room - This hotel room is more spacious and features 2 Single beds, as well as ensuite bathroom, air-conditioning, heating, free broadband internet access, free cable TV, hair dryer, ironing facilities, DVD player, hair dryer, tea & coffee making facilities and free use of the hotels gym. Deluxe Queen Hotel Room - This hotel room has a comfortable Queen size bed, ensuite bathroom, air-conditioning, heating, free internet access, free cable TV, hair dryer, ironing facilities, DVD player, use of the gym and tea & coffee making facilities. Premier King Spa Suite - This spacious hotel suite has a King size bed and has been beautifully appointed to provide elegance and style. It features a spa for two in the ensuite bathroom, air-conditioning, heating, free internet access, ironing facilities, DVD player, free cable TV, hair dryer, private balcony and tea & coffee making facilities. 2 Bedroom Apartment - This spacious apartment consists of one queen sized bed in the main bedroom downstairs and a second bedroom with two single beds upstairs. It also has a spacious bathroom, fully equipped kitchen, separate lounge room, air-conditioning, heating, free broadband internet access, phone, ironing facilities, DVD player, free cable TV, hair dryer and ironing facilities.